Honda will have a pretty big presence at the 2014 Indian Auto Expo, a clear reversal from the 2012 Auto Expo where it did not much to show. Sharing the stage with the 2014 Honda City, Brio facelift, the Honda Mobilio MPV and Accord facelift will be the Honda Brio based SUV crossover. This crossover, which will be showcased as a ‘design study’ has been christened the name Honda Vision SX-1 Crossover Concept. We expect the Honda Vision SX-1 Crossover Concept to be don a close-to-production guise like the Honda Small Car Concept did at the 2010 Indian Auto Expo. The SUV will most probably be mainly targeted towards Asian markets as Honda has already announced the Vezel crossover for many European markets. 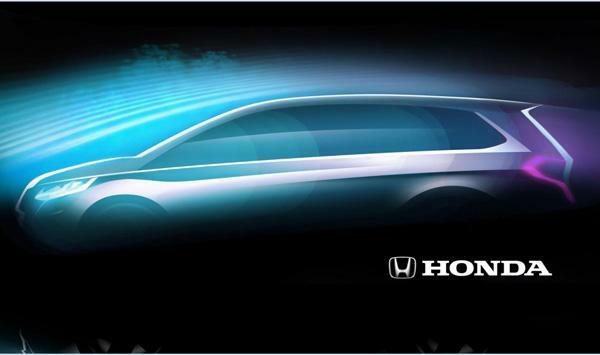 We are looking forward to know more about the new Honda crossover SUV, are you? Let us know in the comments section below. When Honda recently showcased the Honda Vezel crossover, the same brought along the question of when will the car be launched in India. But Honda soon answered the question and it came to light that the car was not going to be launched in India. Instead, a Honda Brio based SUV will be launched in India which will have its engine options borrowed from the Honda Mobilio MPV. Honda wants to make the most of the Brio platform and it has already spawned a compact sedan, the Honda Amaze and a MUV, the Honda Mobilio apart from the Honda Brio hatchback. The SUV will be the latest member of the family. The car will share its wheelbase with the Honda Mobilio which stands at 2,650mm, a full 250mm more than the Amaze which is based on the same platform. The car will be over 4 metres in length which will make it a true blue SUV instead of being a compact SUV. Honda will be aiming for a sub Rs 7 lakh price tag to rival the Ford EcoSport and it will be looking for a higher level of localisation to achieve that. Propelling the car will be a 1.5 litre i-VTEC petrol motor that develops a maximum power of 117 BHP and a peak torque of 145 NM that can be found on the latest generation Honda City. Joining the petrol motor will be a 1.5 litre i-DTEC diesel engine that has a power output of 99 BHP and a peak torque of 200 NM. The same has been proven to be the most fuel efficient engine in India in the city and will be one of the key selling points of the SUV. Its key competitor will be the Renault Duster, Ford EcoSport and to some extent, the soon to be launched Mahindra Scorpio facelift. We Indians love our SUVs and Honda as a brand already has a high value in the minds of the consumer. The Honda Brio based SUV is bound to be successful in markets like India if it gets priced right. Expect the SUV to be launched in the later half of 2015 or early 2016.